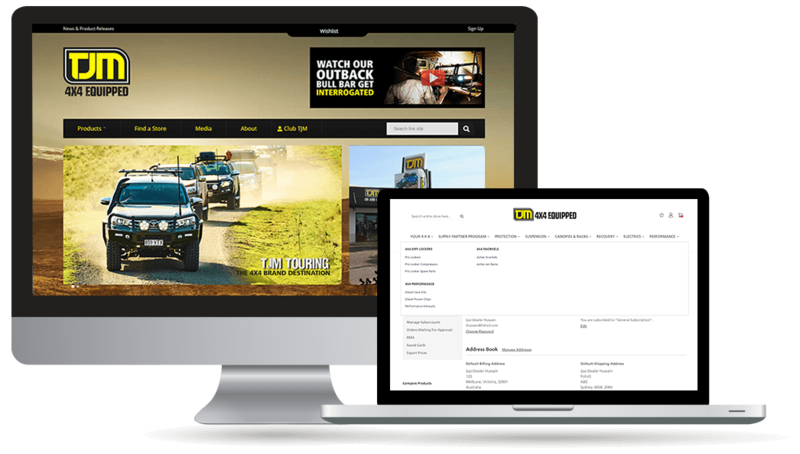 TJM is an Australia based manufacturer and retailer of high performance 4WD equipment and accessories, with over 80 retail locations across Australia. The company also sells internationally via a network of distributors. TJM wanted to expand its customer base and revenues by tapping into the ecommerce channel. Being a manufacturer and retailer at heart, they did not have expertise in-house to build their own ecommerce web stores. The company was looking for an experienced ecommerce development partner to help them build Magento based B2B ecommerce sites for the Australia, US and South Africa regions. Since they use Microsoft Dynamics AX for their back office, the company also wanted their Magento ecommerce sites to be fully integrated with their ERP, so they could centralize their operations in one system. Folio3 also integrated all three Magento 2 storefronts with TJM’s Dynamics AX ERP using its proprietary Dynamics AX Magento Connector. The integration provides seamless transfer of order, customer, inventory, fulfillment and payment data between Magento and Dynamics AX. All three sites together with the Dynamics AX integration were made live within a short span of four months. Thanks to Folio3 efforts, TJM’s dealers and distributors can now purchase the company’s products directly online, without needing to call or visit one of the company’s retail locations. The ecommerce sites have also bolstered the company’s sales, with revenues up by 40% in the three months since the Magento web stores went live. Thanks to the seamless integration provided by the Folio3 Dynamics AX Magento Connector, TJM has been able to streamline their sales and supply chain operations, with reduced order turnaround times and just-in-time-inventory, thanks to the enhanced visibility provided by the integration. The partnership is on-going, with the Folio3 team currently working on the company’s B2C Magento sites for the US & Australia regions.